Use "Why Earth Science?" to introduce the importance of Earth science to your students, their parents and guardians, and your school's guidance counselor. Show each of the nine Big Ideas videos either as an introduction to or a summary of activities relating to that Big Idea. Build assessments around the supporting concepts in the Big Ideas videos. Have your students create their own learning materials for younger age groups based on the videos. For more detailed information supporting each video, visit Earth Science Literacy Principles. The Earth Science Literacy Initiative, funded by the National Science Foundation, has codified these underlying understandings of Earth science which form the basis of the Big Ideas videos. 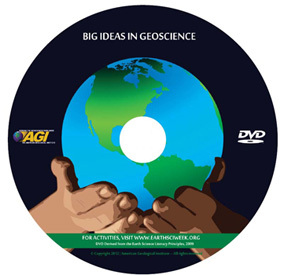 The Big Ideas DVD is included in the Earth Science Week 2011 Toolkit. To view the Big Ideas videos online, please see YouTube or TeacherTube.